Rev your engines! Chuck and his friends — Digger, Handy, Rowdy, Biggs, Boomer and Flip — are back for more adventures, so get ready to throw fun into high gear! On January 13, 2015, Shout! 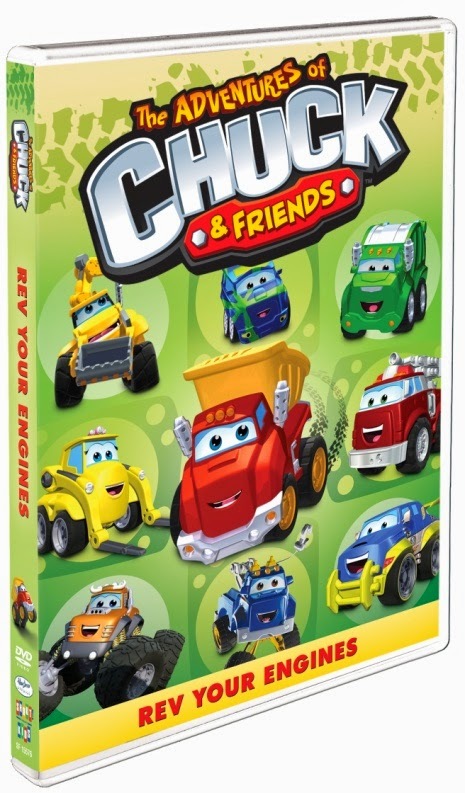 Factory Kids in collaboration with Hasbro Studios released The Adventures of Chuck & Friends: Rev Your Engines. The DVD features 10 exciting episodes as well as a bonus all-new sing-along, and has a suggested retail price of $12.99. The Adventures of Chuck & Friends series is currently airing on The Hub TV Network in the U.S. and on Treehouse in Canada. We had the opportunity to review The Adventures of Chuck & Friends- Rev your engine. The DVD comes with 10 episodes that are filled with excitement, singing and laughing and all starting with new adventures. My 18 month old son has be obsessed with trucks and wheels since he was old enough to flip over a truck, so when we started to watch Chuck & Friends it grab his attention immediately. When I put this DVD on for my son he began to laugh and smile, he love the music and jiggles his little head to the beat. He watched it all the way through without losing interest. He has watched the DVD a few times now and enjoys it every time. If you have younger children I would highly recommend this DVD. Disclosure: All opinions are my own. I received The Adventure of Chuck and Friends: Rev Your Engines at no cost for the purpose of this review. No other compensation was received.